The Chevrolet Camaro ZL1 is an American automobile manufactured by General Motors. The first production started back in 1966 and it was designed to compete with Ford Mustang. Four different generations of the Camaro were developed before production ended in 2002. Later in 2009, the fifth generation was in production and today we have the sixth generation Camaro, a completely improved sports car. The Chevrolet Camaro is usually classified as pony car or muscle car. This car was replacing its predecessor the Chevrolet Corvair, a muscle car. 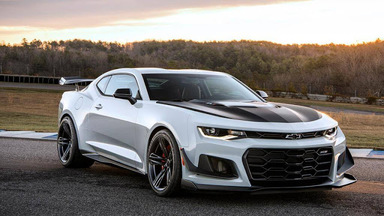 The Chevrolet Camaro ZL1 was built to compete with the most advanced sports car in the world and we can definitely say that General Motors got their formulae well just by looking at the menacing design. The car gets classified as both luxury sports car and muscle car. The design of the sixth-generation Chevrolet Camaro ZL1 has improved greatly. You can clearly say this Camaro is the among the best looking car General Motors has ever built. The massive upper and lower grille openings allow air into the engine for maximum cooling. The carbon-fibre composite hood acts as an air extractor. It directs air from the engine to decrease lift. 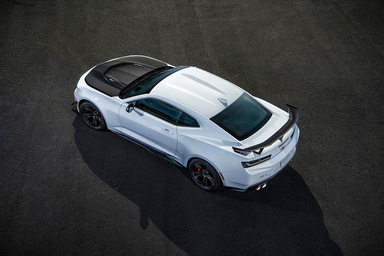 Downforce has greatly increased in the new Chevy Camaro ZL1 with the help of a three-stanchion spoiler and many other components all-together. The front splitter also looks very aggressive. The Chevy Camaro ZL1 takes aerodynamic to another level. Even the front Chevy badge has been hollowed out to increase airflow. The rear diffuser and wing help in keeping a high level of performance during the whole journey. The Chevrolet Camaro ZL1 is also available as a convertible. The fully electronic convertible top can be retracted while driving up to 30 mph. The interior of the Chevrolet Camaro ZL1 is mostly the same as the other types of Camaro except for the steering wheel, seats and exposed carbon-fibre. The car has a flat-bottom steering wheel that makes you feel like you are in a supercar and yeah, the steering wheel is heated. The Camaro ZL1 also features standard RECARO performance seats with well-designed bolsters that help to reduce arm interference during quick shifts. The power seats come with memory package as well. The car has rear seats but do not even think about it due to its size. Maybe only kids can fit back there. The Chevrolet Camaro ZL1 comes equipped with a head-up display, a wireless smartphone charger and Apple CarPlay or Android Auto compatibility. The old school parking brake has been replaced with an electronic one and the car has keyless open and start system. Inside the car is a Bose premium audio system that delivers amazing sound quality. The Chevy Camaro ZL1 has a built-in 4G LTE Wi-Fi that can connect up to seven devices simultaneously. 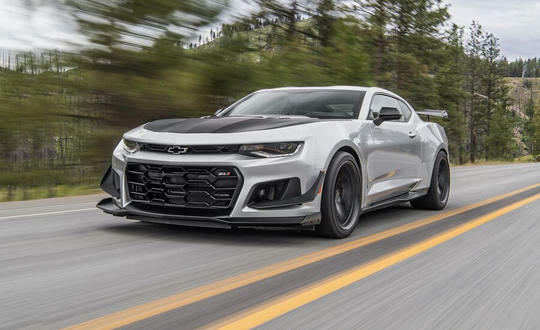 The Chevrolet Camaro ZL1 is the most powerful Camaro ever produced. 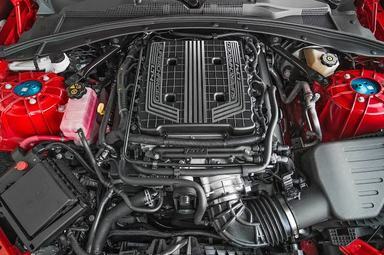 Under the hood lies a 6.2L supercharged V8. The Eaton supercharger has a new cooling design that has more efficient heat exchange thus, providing consistent power during the whole ride. The powerful engine makes 650 hp and 650 lb-ft of torque. You can have either a six-speed manual gearbox with Active Rev Matching or an all-new paddle-shift ten-speed automatic transmission. The rear-wheel-drive Camaro ZL1 will accelerate from 0 to 60 mph in just 3.5s and it will do a quarter mile in 11.4s. The car has a top speed of 200 mph. 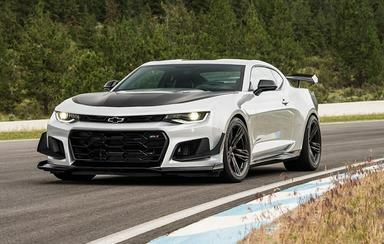 With the help of the 650 hp, the Magnetic Ride Technology and a track aero package, the Chevy Camaro ZL1 has completed the famous Nurburgring lap in an astonishing 7:29:60, better than the last generation ZL1 by nearly 12s. The lighter and stiffer platform that the new ZL1 is built on has also helped a lot in breaking this record. The Chevrolet Camaro ZL1 uses standard 20 inch forged aluminium wheels that are wrapped in Goodyear Eagle F1 SuperCar summer-only tires that are best for track use. The car also has large Brembo brakes that allows precise braking while resisting fade. The Chevy Camaro ZL1 features Magnetic Ride Control suspension that reads the road conditions 1000 times per second. As you hit a corner, the suspension gets stiffer and body roll is reduced immediately. This system basically allows you to drive your Camaro ZL1 to its limits while keeping you firmly on the ground. 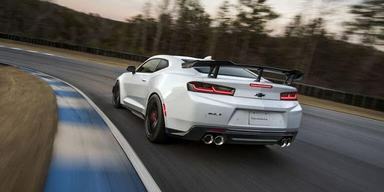 The Chevrolet Camaro ZL1 is also equipped with Performance Traction Management System (eLSD) that makes it easier for you to achieve quicker lap times by giving you high-speed stability, improving "turn in" response and corner exit speed. 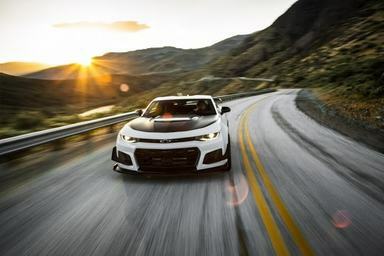 The new ZL1 has Custom Launch Control which uses Performance Traction Control to keep the rear tires spinning at the correct speed and it also allows you to adjust your launch RPM as well as wheel slippage through the Driver Information Centre. The car also has a Line Lock feature that primarily allows you to lock the front wheels thus allowing the rear wheels to spin, warming the tires for maximum grip. The 2018 Chevrolet Camaro ZL1 comes with a 1LE Track Package which will improve aero and downforce much more. The package will feature exposed weave carbon-fibre wing, front dive planes and adjustable suspension. This package will make the car much more agile around the track. The Chevrolet Camaro ZL1 has a starting price of around $62,000. Currently, anyone interested can order one and you can also build your own on Chevrolet website. For such a performance, I think the Camaro ZL1 is worth the price. Thank you for your precious time and please share this article with your friends who might be interested in the topic. Don't forget to comment down below your thoughts and any suggestions or tips. Also, subscribe to our newsletter so that you don't miss out when we upload new contents.